Living by the levee of the great Mississippi has its advantages. For years, we went over the levee and down near the river to pick blackberries this time of year. When you saw a neighbor walking toward the levee with a bucket, it was the signal to get down there before all the berries were gone. We would take sticks to scare off any snakes, and we filled huge buckets with beautiful, plump berries. Later we made blackberry cobblers and served them warm with vanilla ice cream. Lately there have been “No Trespassing” signs nailed up and I haven’t walked through the paths down to the river in a while. I miss it because it was a wonderful sanctuary for turtles sunning themselves on logs and beautiful birds flying about. But I mostly miss those blackberry cobblers. I also became infatuated with picking blueberries around the time I stopped picking blackberries. It is so much more civilized, especially if you have a friend who owns a blueberry farm. We have been just that lucky, driving an hour or so each year northeast of New Orleans and again filling our buckets with the blue gems that are so readily available every June on tall bushes. You don’t even have to stoop over to get most of them, and they last for a year or more in the freezer. Now strawberries are so readily available, all you have to do is go to the store and select from overflowing tables. I love all strawberries but there are none quite as good as the Louisiana strawberry. I wish scientists would quit fooling around with them, because I like the old varieties that were small, juicy, sweet and red all the way through. Ours are still red but, to me, the bigger they are, the tougher they get. Sometimes the texture is almost like that of an apple. It is a marketing tool to make them prettier and ship better, but I’m selfish and want to keep them small, juicy and all to ourselves. 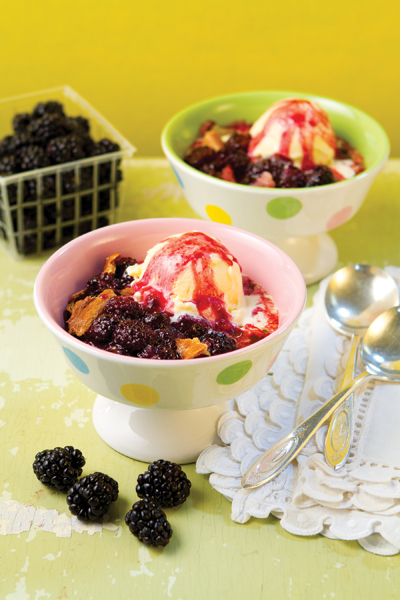 As far as blackberries go, my favorite has always been the cobbler, served a la mode. It is so easy to make, especially with refrigerated pie dough that’s as good as homemade. You can get creative with blueberries in anything from sauces to salads. It is hard to resist them in cakes and pies. And I snatched this recipe from the Internet. Although strawberries are best out-of-hand or with whipped cream and shortcake, this parfait is delicious and easy enough to put together. Rinse blackberries well. Drain and place in a 5-by-7-inch baking pan or dish. Stir in sugar and flour. Dot with butter cut into small cubes. Preheat oven to 400 degrees. Roll out pastry to fit top of pan, tucking just over the rim of the pan. Brush with egg white. Cut several vents in pastry. Place in oven and bake for 30 to 45 minutes or until brown and bubbly. Serve with a scoop of vanilla ice cream. Combine 1 cup flour with baking powder and salt and set aside. Using a mixer, beat the butter on medium high speed for 2 minutes. Then add the sugar and vanilla and beat until light and fluffy, a couple of minutes more. Add the eggs one at a time and beat until well-blended. Reduce the speed of the mixer to low, and slowly add the flour mixture, beating until smooth. Pour the batter into the prepared baking pan. Combine the berries with the remaining teaspoon of flour and the lemon juice in a bowl. Spoon the berry mixture over the batter. Bake on middle rack in oven for 1 hour, or until a toothpick inserted into the center comes out clean. Remove from oven and cool cake in the pan for 10 minutes. Carefully slide a thin knife around the edges of the cake and transfer the cake to a platter, berry side up. Dust the cake with powdered sugar before serving. Save 4 small berries, stems on, for garnish. Slice others in half for small, in fourths for large. Place in a bowl, mix in 1/3 cup sugar and set aside. In an electric mixer, mix 1/3 cup sugar, cream cheese, yogurt and 2 teaspoons Amaretto until well-blended. Set aside. Also in an electric mixer, whip cream until small peaks form. Add 1 teaspoon Amaretto and whip until stiff peaks form. Reserve 4 heaping Tablespoons of the whipped cream for topping, and fold the rest into the cream cheese mixture. In 4 large parfait or red wine glasses, place half the strawberries, top with half the cream cheese mixture and then half the crumbled cookies. After making 2 layers of each, top with reserved whipped cream and reserved whole strawberries on top. Keep refrigerated until ready to serve. This is best made a couple of hours or more before serving.